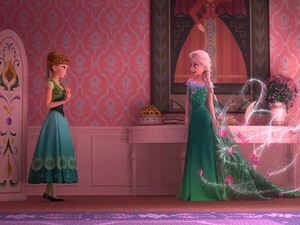 Disney Screencaps - Frozen Fever.. . Wallpaper and background images in the Mason Forever! club tagged: photo disney screencaps disney screencaps mason shipper mason shippers princess disney princess anna elsa sven olaf kristoff frozen frozen fever. This Mason Forever! photo might contain bruidsmeisje, diner jurk, diner toga, formele, avondjurk, formeel, diner-jurk, japon, and jurk.